My research is centered around low-dimensional topology (left) and representation theory (right). 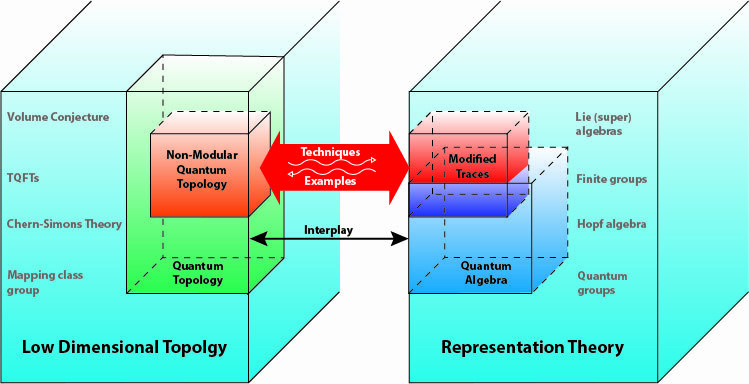 Much of the productive interplay between quantum topology (green) and quantum algebra (blue) relies on categories having certain properties, like being semi-simple. My current research focuses on broadening this interplay to a larger framework which includes non-semi-simple categories (orange). In particular, I am developing a new theory of re-normalized invariants of links and 3-manifold within quantum topology and drawing connections with this theory and a variety of topics including the Volume Conjecture, TQFTs, and mapping class groups. The topological techniques in this theory lead to a new notion of modified traces (orange) which are closely related to some basic concepts in representation theory. These traces are useful tools in providing addition examples in topology. Much of this work is interconnected with mathematical physics which I am investigating within the context of Levin-Wen models. This research is supported by my recent NSF CAREER Grant.